Monrovia released the 2019 Football Schedule. Look at that non-league – Los Altos, South Hills, Covina, Arroyo…like it! 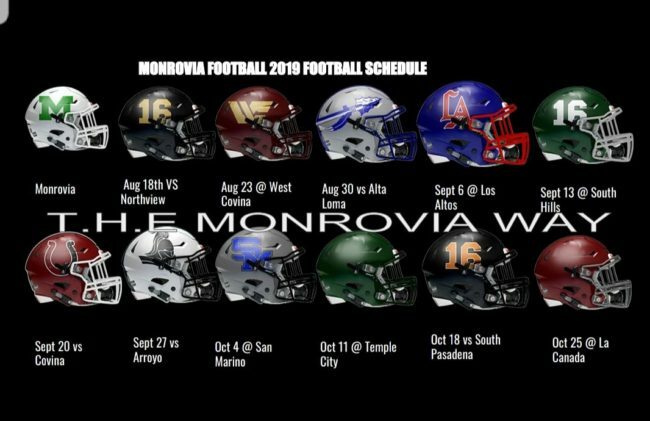 24 Comments to "Monrovia 2019 Football Schedule"
The best RHL opponent El Monte would compete with is temple city. yeah, it was what would serve both good. I know people liked that rivalry but sometimes as they say, “nothing gold [good] can stay.” It was a little fun but as an Arcadia alum, i’m glad their rivalry ended with an Apache win at Monrovia Wildcats’ stadium. I heard/saw even Crescenta Valley used to scrimmage Monrovia but not anymore and replaced Monrovia with Golden Valley for scrimmage. And I guess it seems like Burbank is also moving on after playing Monrovia for 4 years and winning all of them if you don’t count their 2015 “Loss by forfeit”. Wow, Arcadia backed down? I’m a little surprised to hear that! Must be one hit wonders! Monrovia however would be a good challenge for El Monte. El Monte would be a good nonleague opponent for Monrovia as long as both got good coaches to coach up good athletes. I also believe Arroyo, Monrovia, Pasadena, John Burroughs, John Muir, San Marino, Temple City, and South Pas would best compete with Rio Hondo Prep for nonleague..Pasadena Poly would best compete with Monrovia, San Marino, John Burroughs, Pasadena, and John Muir. @Arcadia BACKED out!, @Informed, @Rider since following the Arcadia 22-21 win over Monrovia, Coach Policky knew he was done playing Monrovia after them playing each other for too long for nonleague/preseason. It was just time for a new and different direction to try out new opponents unless Arcadia and Monrovia end up in the same league. In the pacific league however, Monrovia is best able to play teams like John Burroughs, Muir, and Pasadena a little, despite them being blownout at San Marino 7-42..
@Anonymous couldn’t have agreed with you more. It’s good Arroyo beefed their schedule with Monrovia. A good opponent Temple City and South Pas could book would also be Pasadena and Burroughs. (TC maybe could compete with Muir a little, otherwise Muir would control TC and South pas would have no way to handle muir although LC would fare worse against Muir, but at least LC scrimmages PHS and are perfect to begin their season scheduling Herert Hoover hence they look simolar tier if you compare them on paper which made that close game sense). South Pas and Temple City could pick Nogales, Rowland, John Burroughs, and Pasadena for their nonleagues..
@Pac 5 Scout I think Nogales would best compete with South Pas, Temple City, and La Cañada for RHL opponents and Glendale, Hoover, Burroughs, and PHS for pacific league. Duarte would now at this point be best with booking La Cañada but other RHL teams could beat them including South Pas and Temple City…but they can compete with Glendale and Hoover for Paciic League opponents. Misinformed they were set to play this season and they pulled out. True story. Monrovia and Arcadia haven’t played the past two years. Arcadia didn’t back out because they were never in and haven’t been for two years. The Cats have alot of gaps to fill, especially up front in their line, and linebackers. But I suspect all the transfers from the Rancho area now attending Monrovia will help em out. @Rams Fan – They probably should have redone the RHL schedule after Blair left the league. Monrovia’s H/A split is 1/3 and San Marino’s is 3/1. Last year it was the opposite. (The rest of the league stays at 2/2. ) Monrovia’s non-league schedule is 3/3 home and away. From talking with a few people, the original schedule they posted had Arcadia on it. Then right before the holiday break the Arcadia HC backed out and told Monrovia they dont want to play anymore and they were out! They want no part of the Bank, or even Arcadia! That was supposed to be a “play down” game, 4-years later.. 0-4 against The Bank. Turned out to be just a tune up game for The Bank to get ready for the season. The AD screwed up scheduling. Normally 5 home, 5 away. Unless no one would play them so they had to take what they could get. Is something wrong with their field? They have 6 total away games? Only 1 home league game? Good schedule but seems they are biting off too much. The risk of injury to their smaller team against superior talent does not seem worth it. A games against Nogales and Duarte would have been smarter. Monrovia is not what they were a few years ago. What is Arroyo going to look like without there stud ad? That is an interesting game!!! For a MVL guy, the Arroyo game is intriguing. About time Arroyo stopped scheduling the likes of Nogales, Rowland, South Pas, and Temple City. If including the scrimmage it looks like another 5-6 season for the Cats. What a great preseason schedule. Awesome job on picking games people want to see. Is it just me or is there 11 games on there ? How do they have 11 games? From T. Peterson: The Northview game is a scrimmage but they just included it in the schedule. Regular season is 10 games.